The newly renovated apartment Majic is located on the ground floor and for sure you will like its many details, and of course its position, not far from shops, restaurants and ten minutes from the beach on foot. It consists of a kitchen, living room with two sofa bed, and a bedroom with a double bed. The bathroom has a shower. 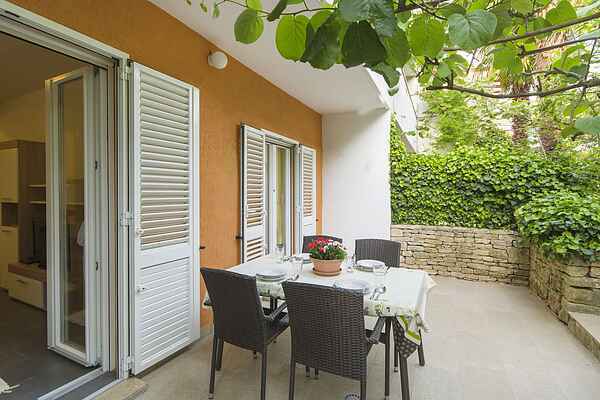 The bedroom opens to a terrace with a garden for personal use, which is equipped with a barbecue and garden furniture where can enjoy the relaxed conversations late into the night. The price includes the use of air conditioning, Wi-Fi, and in front of the building there is parking for your four-wheeled friend.